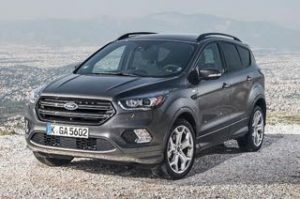 The Ford Kuga has received its mid life pep up, before it is replaced at the end of 2019, this usually involves updating the light cluster and moving the cigarette lighter, but Ford have ‘gone to town’ transforming the Kuga inside and out. The slim grille of the older model is replaced by a bolder chrome design featuring a much more prominent Ford logo. The new headlights are slimmer and squarer incorporating LED running lights. At the rear the redesigned set of taillights are squarer than before. On Titanium and above models, a new 8-inch infotainment system controls the navigation and audio functions, and removes much of the clutter from the cabin. The heating controls are more tidily laid out than before and a new three-spoke steering wheel helps to freshen things up further. The practical 481 litre boot remains as does the sure footed driving characteristics, enhanced further in ST-Line trim as the car sits 10mm closer to the ground with a sportier suspension setting. 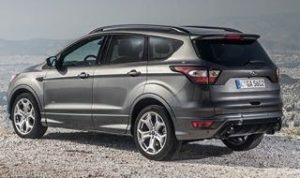 The Ford Kuga is available in Zetec, Titanium Edition, Titanium X Edition, ST-Line, ST line Edition and the luxury Vignale trim. Zetec trim comes with 17 inch alloy wheels, DAB radio, cruise control, heated front windscreen, fog lights, rear parking sensors, leather trimmed gear knob and steering wheel and engine start button. Titanium Edition adds the delightful 8 inch touchscreen infotainment system (with SYNC 3 voice controls and phone mirroring), built in Sat Nav, 18 inch Alloy wheels, electric parking brake, partial leather seat trims, privacy glass, automatic lights and wipers, dual zone electronic climate control and keyless entry, Titanium X Edition adds 19 inch alloys, Bi-xeon headlights, LED rear lights, opening panoramic roof, full leather, heated seats, auto tailgate. 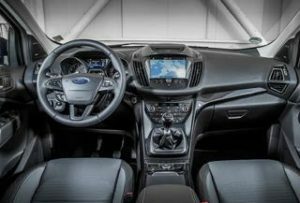 The new ST-Line looks the sports part with the lowered suspension, 18 inch dark alloys, black roof rails, red stitched partial leather seats, flat bottomed steering wheel and park assist. ST Line edition has 19 inch ‘rock metallic’ wheels, large rear spoiler opening panoramic roof and keyless entry. The Vignale has 18 inch ‘nickel’ alloys, Bi-xeon headlights, LED rear lights, Windsor leather seats, heated front seats, rear view camera, enhanced park assist and electric tailgate. 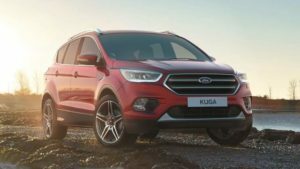 A new diesel engine joins the Kuga range. The 1.5-litre unit produces 118 bhp and is claimed to return 64.2mpg making it the most frugal choice in the range, it is sprightly enough with good mid range torque and can reach 62 miles per hour in 12.7 seconds as a front wheel drive manual car. The 1.5 litre (EcoBoost) petrol engine with 148bhp is faster hitting 62mph in 9.7 seconds but the economy drops to 44.8 miles per gallon, this drops to 38.2 mpg (or much lower in real life) for the 180bhp automatic car. The two litre diesel engine in front wheel drive with 148bhp is the pick or for those that need and extra boost, the 178bhp version is avaialble in upper trims with all wheel drive as an auto or manual. The Kuga perfectly suits the big diesel, the 148bhp with front wheel drive can reach 62 miles per hour in 10.1 seconds and the 4WD 178 version 9.2 seconds. Fuel economy is excellent with official figures of 54.3 miles per gallon for the big diesel. The Ford Powershift automatic gearbox is a good match to the 1.5 or 2.0 diesel, it takes very little off the performance or the fuel economy. We really like the look, and the additional features, of the ST-Line and it would be our choice if the funds stretch. Zetec trim have a free Appearance Pack this Quarter worth £425 which adds privacy glass and silver roof rails. Vignale prices start at £1945 AP, Auto prices start at £545 for the reportedly very thirsty 1.5 litre petrol and you are much better served with the detuned automatic 118 bhp version of the 2.0 litre diesel starting at £845.